Historical Background: Lt. Gen. Henry Hawley took command of the British army after the disaster at Presontpans. He marched into Scotland to try and break the Jacobite siege of Stirling Castle. He brought the Jacobites to battle near Falkirk. He thought he was in a good defensive position, but the Jacobites outmaneuvered him. A pouring rain soaked the battlefield, and the powder. The Royal artillery got stuck in the mud and never made it into battle. The English tried to break the Highlanders with a cavalry charge, but this ended in disaster. The Highlanders won a victory, but it would be their last of the campaign. The Jacobites eventually abandoned the siege of Stirling Castle. The Second Jacobite Rising would end in defeat at the battle of Culloden a few months later. Battle Report: At the start one Highlander unit was sent into the center of the battlefield to see what would happen. An English unit came out to meet them and got steamrolled by a charge. The Scots cheered. Then the English sent a cavalry unit that destroyed the celebrating highlanders with a charge into the flank. Lord George Murray decided to advance and take on the English cavalry. This led to a series of hard fought battles between the highlanders and cavalry that led to heavy casualties on both sides. Gen. Huske's command on the English right advanced like a madman to engage the highlanders at close quarters. His men got chewed up and Huske was killed. The English survivors backed off as quick as they could and went into a defensive formation on the English right. At the same time the English left was crumbling, with Ligonier going down on the same turn as poor old Huske. But the English center was still strong, and the English cooked up a plan to attack in the center and try to take out the Young Pretender. Prince Charles had advanced a bit too far towards the front lines, and was just asking for trouble. Too bad the English plans were overheard by the Jacobites, who formed a defensive wall of Life Guards and Irish Picquets in front of Charlie and escorted him to the safety of the rear. The Jacobites showed no desire to push their advantage against the English right flank, which had forted up like a porcupine. But they saw some opportunities on the left flank which was where they started to press hard. The English rushed their two remaining commanders to stem the flow. Both Hawley and Cholmondeley were killed in the same action, leaving the English leaderless. Still the Jacobites were slow to take advantage. The Jacobite left wing had stopped moving entirely. Lord Drummond and Lord Murray led the Jacobites in a charge designed to roll up the English left flank. Somewhere the English had found some dry powder and fired off a good volley that blasted both commanders out of the saddle. The battle was judged to be a decisive victory for the Jacobites. The Miniatures: Strelets makes 1/72 plastic miniatures for this time period. For the British you could use figures from Mars' set of Saxon Troops for the War of Spanish Succession. Mounted commander were based individually, all figures were mounted two per stand. The cavalry were mounted on a 1.5" square base. Mounted commanders, infantry, and artillery crews were mounted on bases 1.5" wide by .75" deep. Here are some paper soldiers you can print and use. Movement: All units and commanders move 6". Cavalry cannot move faster because the battlefield is muddy. Units cannot move closer than 1" to the enemy except when charging. Wet Powder: Heavy rain soaked the battlefield and both armies. This reduced the effectiveness of musketry. The shooting rules are modified to reflect this situation. Before any unit can fire it must roll one die. The die roll is halved (round up). That's how many bases have dry powder and will be able to fire this round. Shooting: Infantry can shoot 12". Units may only shoot at enemy targets in front of them. If the wish to shoot at a target to the side they are only allowed to fire with two bases. They may not fire to the rear at all. Roll 1D6 per base and remove one enemy base for each 6 rolled. If any unit in a formation is in range then all the bases in the formation may fire. Once a unit has fought a round of melee they may not shoot, or be shot at, until the melee is finished (note this means that both sides can shoot at each other during the turn that the units move into contact, but not on subsequent turns if the melee continues past the first round). It takes three hits on the same turn to eliminate a cannon. When an infantry unit fires at a unit that is charging them they have a greater chance of causing hits. In this case they hit on a roll of 5 or 6. Charge: Units may charge the enemy only if they can reach an enemy unit with their charge move. 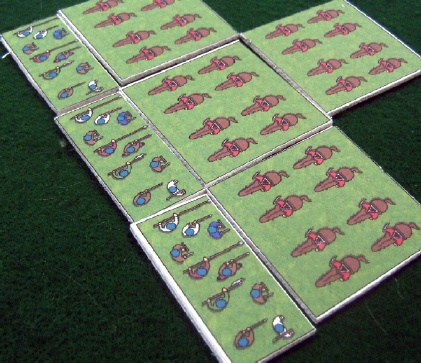 Infantry and cavalry can charge 6". Both sides make their charges at the same time. If it matters, the Jacobites charge first. When a unit charges it is moved into contact with the enemy unit. Melee: Enemy units that come into contact after a charge are locked in melee. All bases in a formation participate in the melee (unless hit on the flank or rear, see below). Roll 1D6 for each base and commander in the melee. Both sides should roll at the same time. 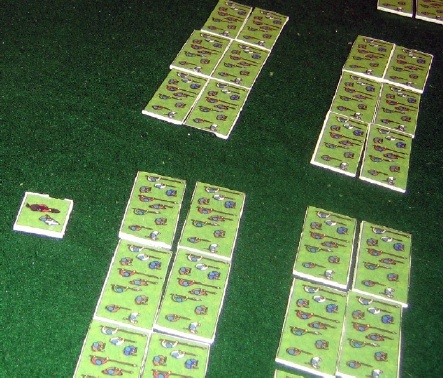 Infantry units hit on a roll of 6. Jacobites hit on a roll of 4-6 if they charged during the turn, and hit on a 6 if they didn't charge this turn. 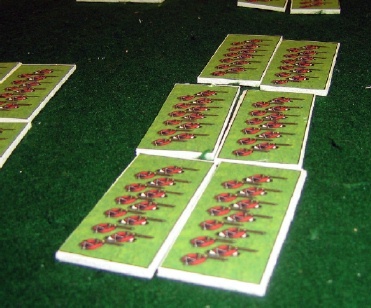 Cavalry hits on a 5 or 6. Commanders involved in a melee always hit on a roll of 4, 5, or 6. Remove one enemy base for every hit rolled. If both sides still have bases remaining they remain locked in melee and cannot move or shoot. The survivors will fight again in the next melee phase. If a unit is fighting a melee with more than one enemy unit each base still only gets to roll once, they don't get to roll to hit each enemy unit. The commander can choose to divide his hits against the enemy units in any way he chooses.